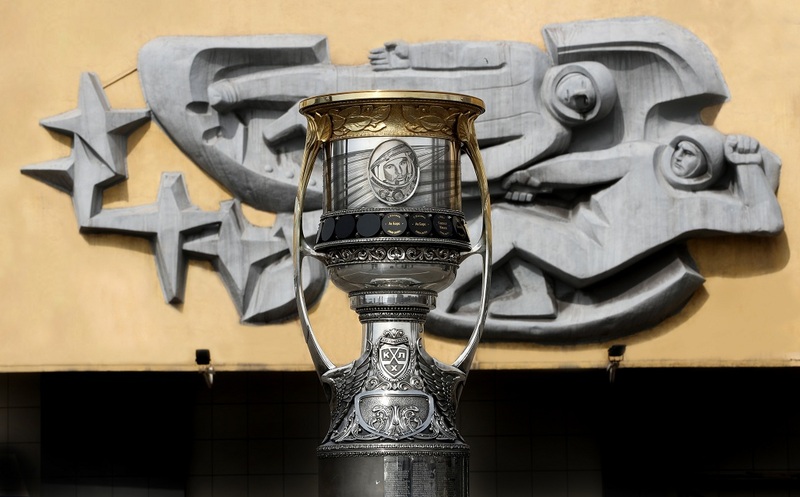 One of the more romantic consequences of Metallurg Magnitogorsk’s presence in the Gagarin Cup final is that the trophy itself, the most coveted piece of silverware of all, is taken on a tour of the capital of the world steel industry – Magnitogorsk. There was a wonderful surprise for these young players from the Metallurg hockey school as they arrived to take part in what they thought would be a routine training session. Waiting for them on the ice was the KHL’s main trophy. The children, all 7-8 years of age, were overjoyed at the chance to touch the Championship’s own Holy Grail, and even though some were scarcely bigger than the cup, they eagerly took turns in holding the glittering chalice aloft in victory. This was a day they are unlikely to forget. Next on the itinerary was the observation deck, ideal for a panoramic view of the city. Here the trophy was honored with a salute from Vadim Kudryashov and Pavel Marychev of the Ural Cossacks Cavalry. The famous Magnitogorsk Iron and Steel Works is the city’s heart and soul, pride and joy, biggest employer, the reason for the city’s existence, and the workplace for most of Metallurg’s passionate fans. Naturally, the Gagarin Cup headed for the foundry’s main entrance on Komsomolskaya Square. At the entrance to the city’s Park of Veterans stands one of Magnitogorsk’s most famous monuments: a stone sculpture of the tent that sheltered the brave, pioneering workers who arrived here to begin constructing the Iron and Steel Works and its surrounding city. Here is the Gagarin Cup by the “Tent of the First Builders of Magnitogorsk" monument. Magnitogorsk for most means molten metal and hockey heroics, but it also boasts a ski center. The complex, also called “Metallurg Magnitogorsk,” caters for many kinds of downhill and mountain sports, and with winter fading from memory and the hockey season nearing its climax, the skiers and snowboarders were delighted to encounter the famous trophy on the slopes. After Monday’s Game 2 of the final series, the action moves to Saint Petersburg, where, on Thursday, the 13th of April, the Gagarin Cup trophy will embark on a tour of the most famous landmarks in Russia’s Northern Capital. The KHL would like to thank Metallurg Hockey Club and the Metallurg Magnitogorsk skiing complex for their assistance in organizing this tour.